Buenos dias, sunshine! Today we are in Mexico where the flowers are beautiful and the climate is hot, hot, hot! 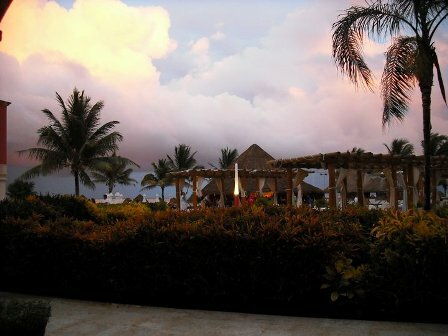 Continental Vacations has terrific deals for Riviera Maya, Mexico. For $938, you can enjoy an all inclusive, seven day vacation with air included. And for those in the northeast, from Newark you can fly nonstop to Cancun in less than four hours. If you want the ultimate in relaxation, you can lounge at your choice of six pools or go to the beach, right outside your front door. Maybe even mix it up by varying both into your vacation schedule! 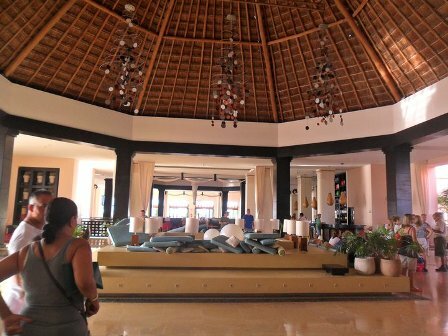 This five-star resort waits on its clientel hand and foot. And that’s no exageration. There are some things you have to be aware of before you go. This section of Mexico in the summer is jungle hot. All suites and rooms are air-conditioned as are the restaurants. But the main lobby, where most activity takes place in the evenings, is not air-conditioned. It’s an open area for gatherings and gazing out at the ocean. There are ping pong tournaments, karaoke, contests and lots of refreshing drinks so that you are not even thinking about the heat. This was my first time in the Cancun region. I am happy I took a chance and booked my vacation. As soon as I walked up to the front desk for check in, I was greeted by a friendly host and made comfortable with the fact that I had been upgraded to a Master Suite, as there were no more smaller rooms available. The hotel does that with frequency. It upgrades its guests without charge. The Ocean Coral Resort offers Mexican food, as you would expect, delicious, prepared hot, and presented as a piece of art. The service is five-stars, although if you dine at 8 PM, you will wait, sometimes an hour. It is better to eat earlier when the restaurants open at 6 PM. There is also an Italian restaurant on the property as well as a sports club that’s open until 6AM. Mike’s Coffee Bar is as wonderful as any coffee bar in Italy, serving all of the special coffees and pastries. Sensai is their Japanese restaurant with a two hibachi grills. And, of course, there is the buffet is a huge double room that’s open for breakfast, lunch and dinner and has everything you could possible think of eating. Poolside the entertainment is run by an Italian early-twenties group. They keep the adults as well as the children busy. Every pool has some sort of entertainment going on after lunch until dinner, if you want to participate. In the evening there is a show room, and this same entertainment staff puts on terrific shows. There is also a teen club as well as a camp for children on the property. 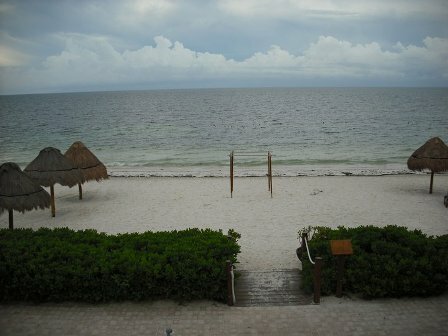 Ocean & Turquesa is definitely a resort that I would go back to many times. It’s fun, it’s relaxing, it’s all inclusive, and it’s priced for family travel. Photos by ©Patricia Florio – All Rights Reserved.